It is always a cause for celebration when the great lady of crime, Baroness James brings out a new novel and it is especially pleasing when she takes on a 'tour' at the grand age of ninety-one! With razor sharp precision, Lady James held her audience enthralled and you can see why she has such respect and admiration from her legion of fans (myself included). 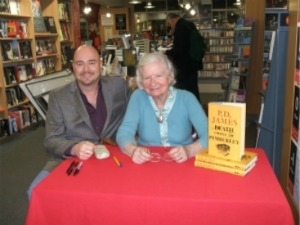 Nothing is false about P. D. James and as she showed at Foyles, she has a wicked sense of humour. Although I had already read her latest novel, 'Death Comes To Pemberley', the author gave me insight to different parts of the novel and a new perspective. Lancaster Gate Hotel, London on the 6th Dec for the Daily Mail Literary Lunch. "...every sentence is like a pearl on a necklace, delicate and precious. " It is the evening before the Lady Anne ball when the residents of Pemberley are disturbed by a coach ridden in a hazard manner and pulls up outside the front door of Pemberley. Elizabeth Darcy’s younger sister, Lydia falls from the carriage in a hysterical state. Unable to get any facts from the girl, it is to the coach driver to tell the household what has occurred. The carriage originally carried Lydia, her husband, Wickham and their friend, Captain Denny. Midway through the woods of Pemberley, Denny ordered the carriage to be stopped and climbed from the vehicle, denouncing Wickham and strode off in to the wooded area. Wickham followed his friend and after a few minutes gunfire was to be heard. On Lydia’s orders the coach driver took them at speed to Pemberley itself. Setting out a patrol that includes Darcy, Colonel Fitzwilliam and Alveston, the three men follow the carriage back to where Denny and Wickham were last seen. Soon they find Wickham prostrate over Denny’s dead body and declares upon their arrival that he has killed him. What follows is an inquest and trial of unsavoury proportions that will envelop the Darcy’s, Bingham’s and all at Pemberley before the truth is finally revealed. I was a little apprehensive with this new novel. It is always a gamble to write about the beloved characters of a respected author. There can be many pitfalls to this practice – not portraying reader’s characters in a good light or even worse placing them in a sub-standard story. It will always be a minefield as an author cannot please all of Austen’s staunch readership. However, James does take a fair crack at it and true to her idol continues the essence and atmosphere of Austen’s best book, Pride and Prejudice. For readers who may not have read Austen’s book, James does a pre-sis at the beginning of the novel to show how each one came to be where they are when her own novel starts and as ‘a la James’, she takes her time before the crime element of the story enters the fray. What follows is a pleasant enough story that is more about each person’s relationship to others than the actual crime which itself is not difficult to work out if you are an avid crime reader. 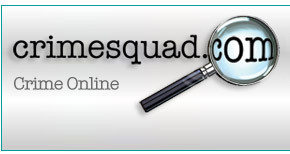 There are certainly interesting facts about the inquest and trial and James has certainly done her research. But what is apparent is that the author does give the book a definite sense of time and place. How antiquated life seems when we have all got used to our mobile phones! Some of James’ readers may have preferred a Dalgliesh to this latest offering, but at the end of ‘The Private Patient’ you could feel the author had turned the last page where her famous detective was concerned. 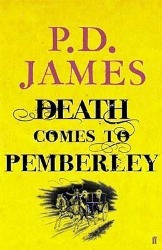 ‘Death Comes to Pemberley’ is like her other novels, well crafted and certainly well written, every sentence is like a pearl on a necklace, delicate and precious. At the grand age of ninety-one you have to admire that James has decided to write a novel at all when others have retired a lot earlier than our razor-sharp Baroness. And for that we must rejoice that we have one more James novel to enjoy!